Our bags were loaded, ready to meet pressing needs on the streets. 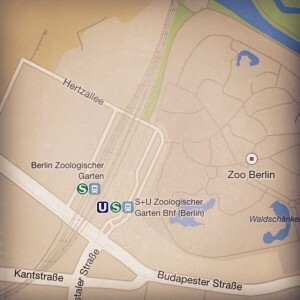 Before our group left the central Serve the City meeting point and headed toward Zoologischer Garten Bahnhof, we had been coached that it would take courage and respect to interact with people who were different from us. Obviously giving out food wouldn’t be a comprehensive solution to homelessness. Still, we were ready to make that proverbial drop in the bucket with a sandwich and a juice box. We began our quest. It wasn’t long before we realized we had a problem. There weren’t any homeless — or at least we couldn’t find them. We learned that two other organizations regularly serve meals in the area on Saturday. Many homeless were probably being fed elsewhere as we walked the empty streets. Slightly dejected and with our sacks still full, we retraced our path. Perhaps we had missed a hidden windfall of homeless men or women. We walked and walked. Still nobody. We cut through a park, not ready to give up. Aside from a few unshaven hipsters who looked like they might be homeless, we were out of luck. There were just a bunch of tourists and cyclists enjoying the beautiful sunshine – and us. We laughed to ourselves at how difficult it was to serve others. We joked that we would probably find a pocket of homeless people on our way home when we didn’t have anything left. Eventually we decided to go to one of the local missions serving a hot meal. The coordinator gave us permission to pass out our sandwiches to those already in line — at least we knew they were hungry! We sauntered back through the park ­– with empty bags and uncertain hearts about our seemingly haphazard generosity. On our way back to the meeting point, we noticed a few sleeping bags and suitcases under an overhang. We slowly approached the patch of grass separating us. A cluster of people was lying right where we had walked only minutes earlier. Sure enough, they were displaced. Of course we would find them now that we were sandwich-less! How had we missed this group entirely? Even with the overhang, they were still visible from either direction. We had passed them when we were looking for homeless people! In reflecting upon the day, I realized that I had naïvely assumed my familiarity with the homeless and desire to connect with them would translate into some competency in aiding them. But mere exposure was not enough. My eyes weren’t trained to register their presence. Sure I gazed past them asking for change as I left the grocery store or sitting outside the train station as I rushed home, but they weren’t part of my world. They were more like extras on a stage – in the picture but silent. That afternoon may not have curbed hunger among the homeless, but it forced me beyond the familiar. And who knows what transformation we might see if we could all get past the surface and begin to see each other. Really see each other. Are there people, places or needs in your community that you don’t often give a second thought? What could you do to eliminate your blind spots? What training or resources are available to you?